Mobile marketing: the best way to reach the smartphone addicted teens? Smartphones play an important role in our lives and especially in that of teenagers and Millennials! On average teens receive their first smartphone when they are 11 and they spend a minimum of six hours a day on it; at least that is what research by Business Insider tells us! Their technological other half never leaves their sight and they check their phone almost every ten minutes. But just how important have smartphones become to teenagers and how does this influence companies and brands? Let’s take a look at how teenagers see life through their smartphone camera! Teenagers can’t get away from their phones; it is the first thing they see when they wake up and it’s the last thing they smile at when they go to sleep. But what is it that makes the smartphone so interesting and what makes youngsters spend six hours a day looking at their screen? Well, results from Mary Meeker’s annual report on Internet trends shows us they mostly use the camera on their phone. Huh, camera you say? Are they just taking pictures of themselves for six hours in a row? Of course not, the main reason why the phone’s camera is so popular is because of the social media apps Snapchat and Instagram. They are now king and queen in social media land and have dethroned Facebook, according to research by Business Insider. Why did Snapchat and Instagram become the teens’ favorite apps to use on their smartphone? Well, it’s fun, easy, visual and apparently far away from the control of their parents. The fact that Instagram is so popular amongst teens provides companies with the ideal advertising opportunity. Instagram offers companies a range of possibilities to advertise on their medium, so why not use this to reach your teen customer? There already are a few companies that implemented this strategy quite well! Take for example the Mercedes campaign Take The Wheel. They have taken Instagram advertising to a whole new level by giving five of the most talented photographers in the app a challenge they could not refuse: they sent them on an authentic road trip in the new Mercedes Benz CLA, but of course they had to document the road trip and post pictures online. Whoever obtained the most Likes on their Instagram posts could keep the car. This campaign resulted in 87,000,000 organic Instagram impressions, 2,000,000 Instagram likes and 150 new marketing assets. This type of advertising has proven its success as the sales hit the roof with the launch of the new CLA. Another great example is Nike’s ‘instaposters’ campaign. With this campaign they succeeded to combine Instagram very well with real life experiences. Nike took the photos that athletes shared on Instagram, printed them on posters and hung them all over the streets in Russia. Friends of these athletes then took photos with one of the posters and posted those on Instagram. This resulted in a waterfall of new selfies and pictures in sporting action. The campaign resulted in 54 posters and 27,805 photos. The least you can say is that Nike just did it with Instagram advertising. 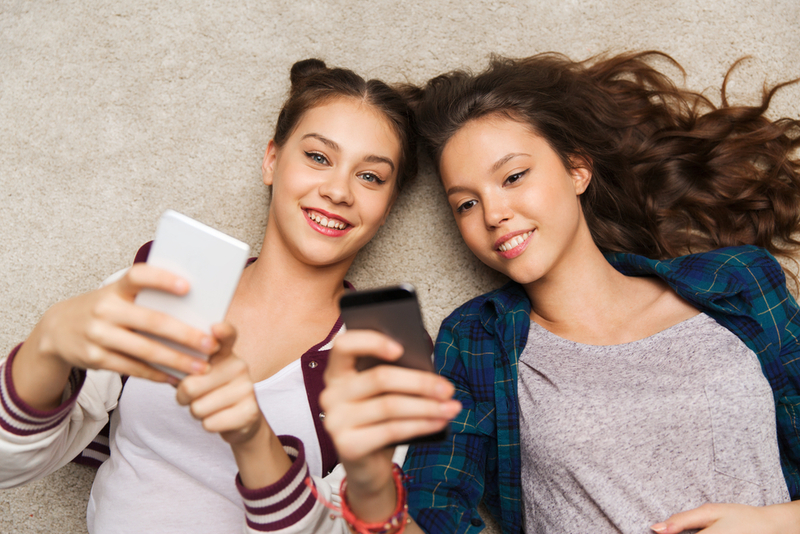 Smartphones are a huge reason why teens manage to always be connected with the outside world and their online network full of friends. But just how do they stay connected with each other? First of all, like mentioned before, through social media apps such as Instagram and Snapchat. But the main occupation on smartphones remains sending each other text messages. According to the Teens Relationship survey by the Pew Research Center, texting is the most popular way amongst teenager to communicate and to keep in touch with each other! Now how does this information affect your company or brand? Well, teens are always available on their smartphone and they never let it out of their sight. This means that they are also available for companies on their phones. If you know that texting is the dominant tool for communication, you have the ideal mix for mobile advertising and SMS campaigns. There already are a few companies that have jumped on the SMS campaign train. The first example is Pizza Hut. Based on locations, the company sends out messages to their target audience with deals for happy hour, lunch buffet and specials. The program went on for 15 months via mobile, but also via TV, radio, Facebook, digital and out-of-home. But the results of the campaign have shown that mobile was found to be the most effective channel in comparison with the others. Another example comes from Inmarko, a Russian ice cream manufacturer that is part of Unilever. To grow their market share and deepen their engagement with trade vendors, the company developed an SMS program that used codes to unlock rewards so traders were triggered to engage with the brand more often. This campaign has also proven the efficiency of SMS marketing as all business objectives were achieved and sales increased with 13%. Still not convinced of the importance of smartphones and the opportunities for your brand? Here are some nice-to-know facts to persuade you once and for all. According to a report by Frost & Sullivan 2010 & Epsilon, the open rate of SMS messages is 98% in comparison with only 22% for e-mails! We believe this is something that companies can work with. Furthermore, the study carried out by the car-sharing company Zipcar shows that 40% of the Millennials prefer losing their car to giving up their smartphone. I guess they will have to take the bus to school or work now. But maybe the most shocking fact is that teenagers would rather lose their sense of smell than their smartphone. Now the question that remains is, what would you prefer to lose? The smell of a delicious meal or your beloved smartphone?